Like many local residents, Paul’s life is intimately connected to Casco Bay. This story is one of many collected this summer by multimedia producer Galen Koch for Casco Bay Estuary Partnership’s Casco Bay Stories Project. The Project is focused on gathering engaging, personal stories about how people use and enjoy Casco Bay and how the Bay is changing over time. Stories explore Casco Bay and its watershed, which includes the lakes and rivers that drain to the Bay. Stories are collected, edited, and posted to www.cascobaystories.org, Facebook and Twitter. Recent stories include tales of an alewife harvester who protects spawning fish, a family who lives on their sailboat in Casco Bay, a local lobsterman, kids exploring nature and much more. Story ideas are welcome. For more information, contact Galen Koch at galen.e.koch@gmail.com or 207-664-4759. The Casco Bay Stories Project was created to listen to and engage with a diverse group of people, businesses and organizations that live, work and play in and around Casco Bay. Casco Bay Estuary Partnership is a catalyst for action with the goal of keeping Casco Bay and its nearly 1,000 square miles of watershed clean and healthy. Partners include citizen organizations and government agencies with a stake in the protection of the Bay. Cove Henry Holloway aboard Tiny Bubbles II. 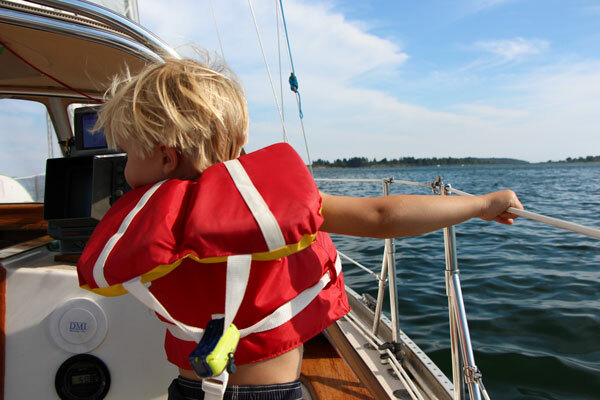 “The boys think it’s neat to take your house with you when you move around.” As part of the Casco Bay Stories Project, Heidi and Josh Holloway share their story about living on a sailboat with two young children in Casco Bay.